Nature View Park, located off of Tonawanda Creek Road, resides on the land purchased by the Faculty Student Association in 1964. FSA originally planned for a $100,000 golf course on the land, but sold the land for $1.37 million in 1987. For three decades, the Faculty Student Association has said it has no idea how much student money went into the $785,500 it used to buy a piece of land in Amherst in 1964. 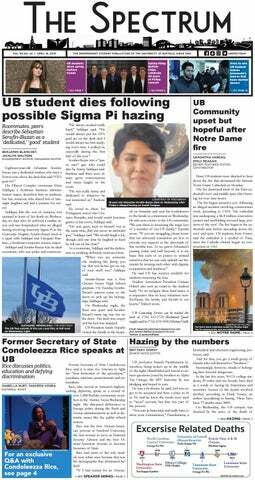 The UB-controlled nonprofit has made that claim in response to efforts by the student-founded organization Sub-Board I to gain control of the money, now worth $1.5 million. SBI says the money belongs to students because the original purchase was made with student fees. The Spectrum spent about one hour searching the University Archives and found records showing that FSA used hundreds of thousands of dollars of student money on the land, potentially bolstering SBI’s claim to the funding. FSA paid for the land with $535,500 in cash and $250,000, through a money mortgage. The records include a 1970 letter written by FSA’s attorneys saying FSA accumulated student money from 1962-64 and initially used the money toward a down payment on the land. “The funds used in the purchase were derived from that portion of the overall University fee charged [to] students which had been allocated first to the Administrative division of [FSA],” the letter says. That included payments of principal on the land’s mortgage, interest, real property taxes and land expenses, according to the letter. FSA paid with the student-generated fund after the land’s down payment with “the final payment on the … mortgage being made from the fund in 1967,” the letter said. FSA used the fund for real estate taxes and other charges at least through 1970, according to the letter. In a May FSA board meeting, FSA Executive Director Jeff Brady said FSA used “some” student fees to buy the land. A number of FSA board members said there is no way to know how much of the investment came from student fees in the meeting. FSA is today known by most students as Campus Dining & Shops. The Spectrum tried to reach both Brady and FSA lawyer Terrence Gilbride of the law firm Hodgson Russ for clarification, but neither responded to numerous attempts to reach them by phone and email. “I firmly believe it is student money and if it is student money, FSA does not have the right to touch that money,” said Kyle Murphy, who was SBI treasurer until May 2018. During May’s FSA board meeting, SBI argued for control over the $1.5 million asset. But FSA members did not favor the transfer. FSA was the fiscal agent for student activity fees in 1964. But when students looked for more control over their money, SBI became the fiscal agent for student governments in 1972. FSA sold the land for $1.37 million in 1987, according to SBI records, and FSA and SBI signed a contract to establish a programming grant fund in 1988. The fund was valued at almost $1.5 million at the end of 2017. The fund awards money to help “launch new programs, expand existing programs or produce publications” at UB, according to the fund’s guidelines. The contract allowed SBI to receive annual interest from the investment, according to Spectrum archives. The interest currently goes toward student programs through the programming grant fund. FSA could dip into the initial money spent on the land if it became insolvent, or unable to pay any money it owes. SBI received about $85,000 in interest this past year, according to Bill Hooley, SBI’s executive director. The contract lasted for 20 years, and it was extended in 2008 by FSA and SBI until 2023. The contract, however, does not say what could happen to the principal in 2023, according to SBI’s lead attorney Joshua Lippes. Lippes said SBI, as the largest organization that represents UB students, should get the money. “Our position is the money is student money and that money should go to Sub-Board,” Lippes said. The contract and its 2008 extension does allow FSA to use the money if FSA became insolvent, which has always been SBI’s concern, according to Hooley. “We have no reason to believe that will happen but if for some reason they did, that money could go to services that have nothing to do with students,” Hooley said. Lippes said in anticipation of a potential lawsuit against FSA in 2023, Murphy, the former SBI treasurer, sent a Freedom of Information request to UB’s Records Management office in May for student activity disbursement records from 1962-71. Murphy also requested documents such as FSA audit records from 1962 to as late as 1988, any and all records regarding the source of funds for the 1964 land purchase, and any and all records pertaining to the land sale, according to Murphy. Murphy said UB could not find records for the request. UB’s Records Management office is overseen by Susan Krzystofiak, the 2017-18 treasurer of FSA’s board and assistant vice president for policy and operational excellence. Lippes said SBI also sent a record retention request to FSA in anticipation of a lawsuit. The request says FSA “must maintain” records from the time period in its possession. “I don’t know if FSA maintains records from the ’60s, but we just wanted to make sure that if a lawsuit does happen in 2023, those records were maintained [by FSA],” Lippes said. During May’s FSA board meeting, Murphy argued FSA should have transferred proceeds from the land sale to SBI in 1987. Murphy said he met with Jeff Brady on March 12 to discuss the money. He claimed Brady told him he would speak to FSA’s lawyers to see if student money was spent on the land. About three weeks later, Murphy said, he ran into Brady near 1Capen. Murphy said he, along with SBI’s executive manager Hooley, met with Brady as well as Beth Corry, associate vice president and controller for Business Services. Corry was the chair of FSA’s board during the 2017-18 academic year. Murphy was optimistic, and he left the meeting thinking students could get the money. But when Murphy entered May’s FSA board meeting, he said he asked Brady the same question he asked two months earlier. Brady did not respond after numerous emails and phone calls. A number of FSA’s board members, such as Dan Zimmer, vice president for corporate finance and development at food service and hospitality company Delaware North, were opposed to Murphy’s opinion in May. “He’s a big proponent on this for some reason even though he’s not an alumni here, and no administrative person said anything in that meeting. Jeff Brady wouldn’t have said anything in that meeting if I didn’t prompt him to say something,” Murphy said. The Spectrum emailed Zimmer, who did not respond to requests for comment. The asset comes from FSA’s over $785,000 purchase of Amherst land in 1964, and later, FSA’s $1.37 million sale of the land in 1987. On Nov. 2, 1964, FSA purchased the land for over $785,500, according to University Archives. The land was purchased from a Tonawanda family, Pearce & Pearce Company, a real estate development and management firm, and the Ellicott Creek Land Corporation. William Howard Pearce, the former president of Pearce & Pearce who died in 1998, was on the UB Foundation Board of Trustees from 1990 through 1998. The land, which consisted of somewhere between 487 and 534 acres according to Erie County and University Archives records, is owned by the Town of Amherst. The land is currently situated between Amherst’s Nature View Park and Tonawanda Creek Road. The land remained vacant throughout FSA’s ownership from 1964 to 1987. In September 1964, FSA proposed a $100,000 golf course to be built on the land for the spring of 1966. The next year, FSA paid an architect $12,000 for a preliminary golf course layout, but the plans never came to fruition. FSA also considered building a boat marina and a summer camp at the land, according to Spectrum archives. By November 1969, FSA weighed its options about the land’s future. FSA considered multiple choices, such as keeping the land, selling it to the UB Foundation, selling it on the open market, selling half of the land or leasing and mortgaging the land. Eighteen years later, on Oct. 30, 1987, FSA officially sold the land to the Town of Amherst for $1.37 million, according to SBI records. FSA profited $589,341 from the land sale, according to its contract with SBI. Prior to the programming grant fund’s inception in 1988, one of FSA’s board members and former UB vice president for university services Kevin Seitz told the board that “no documents have been found in order to determine what percentage of the [land’s] purchasing amount was from student fees,” according to Spectrum archives. Seitz, as vice president for university services from 2002-04, reported under UB’s vice president for finance and administration. The Spectrum reached out to Laura Hubbard, vice president for finance and administration, for comment. Hubbard said she is “consulting with FSA’s counsel” and she would “not have information to share with [us] for” our deadline. She said she expects The Spectrum to get a response from FSA in the future. Hubbard was on FSA’s 2017-18 board. Murphy said students should care about the principal because “it is student money” and should not belong to FSA.